Continued eruptions at Mount Raung in East Java has forced the authorities to shut down five airports in Indonesia, after volcanic ash disrupted many flights between Bali and Australia for a second day. Flight cancellations have since stranded thousands of traveler. 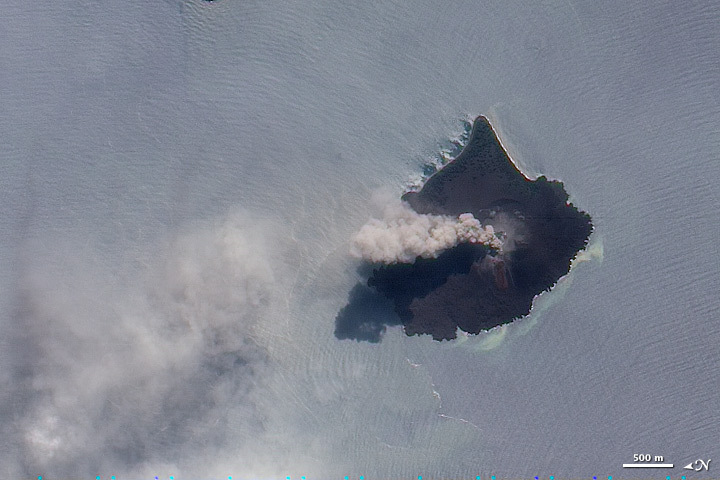 Increased activity was first detected at the volcano on June 24, 2015. The volcano began to eject volcanic matter on June 29, creating an ash cloud that led to warnings being issued to residents within a 3-km radius of the caldera, and flight disruptions in and out of Bali. The 3,333-meter volcano, one of Indonesia’s most active volcanoes, is a massive stratovolcano located in the province of East Java, and has a 2-km-wide and 500-metre-deep caldera. Ruang is about 140km northwest of Bali’s Denpasar airport. 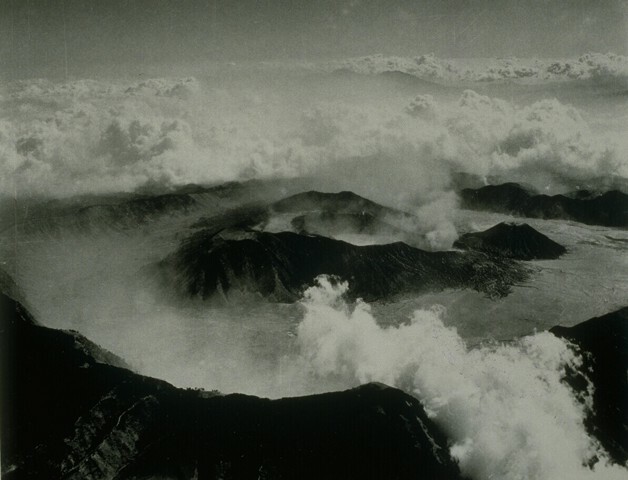 Made up almost entirely of volcanic eruptions, the island of Java contains dozens of volcanoes including at least 45 that are considered to be “active” volcanoes. Eruptions at Mt. Raung have prompted the authorities to raise the volcanic alert from Level 2 to Level 3. The volcano has been ejecting volcanic matter into the air since Sunday, said the Volcanology and Geological Hazard Mitigation Center (PVMBG). Increased activity was detected at the volcano on June 24, 2015. The volcano began to eject volcanic matter on June 29, creating an ash cloud that led to warnings being issued to residents within a 3-km radius of the caldera, and flight disruptions in and out of Bali. “The Jember Disaster Mitigation Agency (BPBD) in East Java said on Monday that the 3,333-meter Mount Raung had discharged molten lava on Sunday evening, confirming the authorities’ recent decision to increase the volcano’s alert status, said a report. More than 2,000 residents in “two districts in Bondowoso lie within Mt. Raung’s potentially Disaster Prone Area (KRB),” and may have to be evacuated in the event of a major eruption. The 3,333-meter volcano, one of Indonesia’s most active volcanoes, is a massive stratovolcano located in the province of East Java, and has a 2-km-wide and 500-metre-deep caldera. Ruang is about 140km northwest of Bali’s Denpasar airport. Mt Sinabung remains on Red Alert, or “Level IV,” the highest level of activity, and three other volcanoes, Soputan, Karangetang and Lokon, stay at Level III, or Orange Alert, the second highest level of activity, according to Indonesia’s Volcanology and Geological Disaster Mitigation Center (PVMBG). Up to 3,000 residents living within a 7-km radius of Mt. Sinabung, to the south and southeast of the volcano, were evacuated on June 4, 2015. Following table shows the current status, as of June 14, 2015. 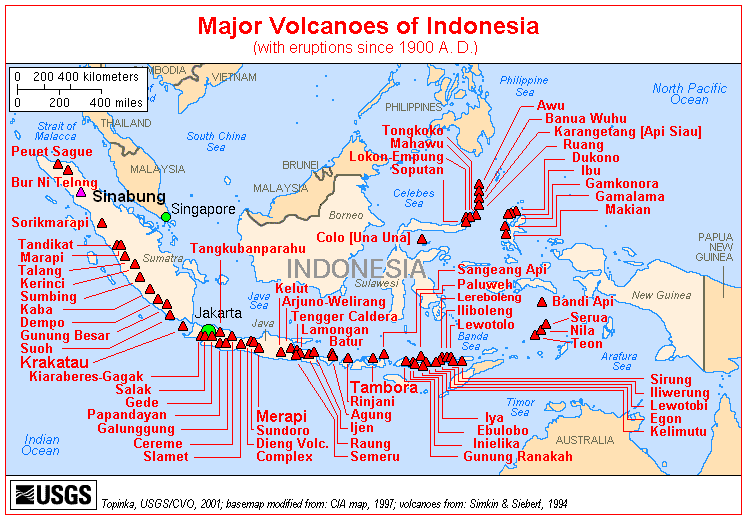 Indonesia Volcano Alerts as of June 14, 2015. Source: PVMBG. Image enhanced by FIRE-EARTH Blog. Mt Sinabung Erupted three times on Saturday leaving at least 14 people dead, including a group of school children from Medan on a science trip, and three others critically injured. Authorities were again forced to evacuate tens of thousands of people from 16 villages from the 5km – 7km exclusion zone near the volcano. 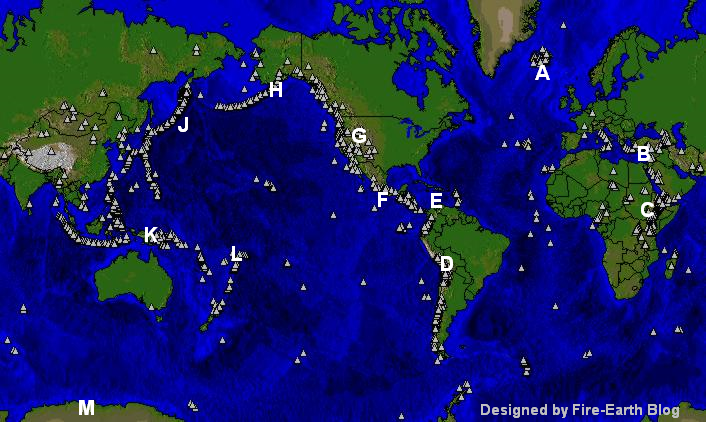 “This is the first direct impact of the Mt. Sinabung eruptions. Before the Saturday incident, the ongoing eruptions have already claimed the lives of 31 evacuees, as a result of various illnesses such as breathing difficulties, depression, asthma and hypertension.” Jakarta Post reported. Some 14,000 of more than 30,000 evacuees had just been allowed to return home on Friday, following earlier eruptions. The volcano became restive in 2010, after more than 400 years of dormancy, and has been erupting sporadically since. Mt Sinabung’s latest explosive eruption has prompted the authorities to raise the volcanic alert to the highest level, “siaga,” or “red alert,” according to Volcanology and Geological Disaster Mitigation Center. The alert level was raised from “orange” or “level III ” to the highest level “red” or “level IV” by PVMBG on Sunday, as the authorities evacuated an additional 11,618 residents from 19 villages and expanded the evacuation zone to a 5-km exclusion zone from 3 km previously. “This is Sinabung’s highest level of activity. 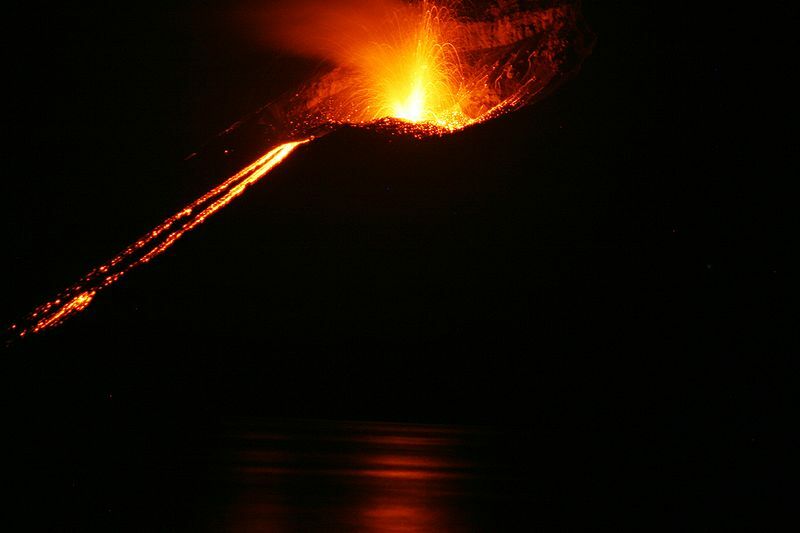 The intensity of the eruptions continues to increase,” said Hendrasto, head of PVMBG. As of 2 p.m. local time on Sunday, Sinabung was continuing to eject an 8-km high column of smoke and ash into the air, he said. Some 6,000 villagers had already been evacuated from the 3-km exclusion zone, about 90 km from Medan, capital of North Sumatra province. The North Sumatra health has distributed 180,000 face masks, medicine and 4 tons of baby formula to relief posts in Karo regency, reported Jakarta Post.